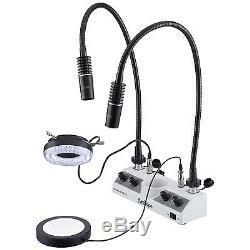 AmScope SW-1B24-L312W-2GOP 20x-40x Super Widefield Stereo Binocular Microscope with LED Gooseneck and Ring Light. Please note that we cannot honor warranties for other sellers' products! 20X and 40X super widefield magnification settings. Offering high quality super widefield stereo erect images. A Super Large Size Table Stand with Focusing Rack. Two gooseneck lamps, a ring light, and an illuminated stage plate for multiple lighting scenarios. Independent control over all lights. 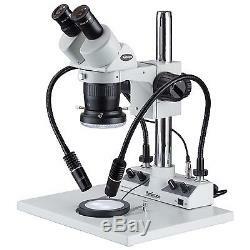 This is a super widefield multi-power binocular stereo microscope head with 20X and 40X magnification settings. It includes a pair of super widefield high-eyepoint WH10X/20 eyepieces coming with 45° inclined 30mm eyetubes with diopter. Its super widefield optics and high-eyepoint design ensure an easy and comfortable observation. The microscope offers high resolution clear images, super widefield of view and large working distance. It fits all the focusing racks with a 3 (76mm in diameter) O-ring holder. The 4-source LED lighting system provides a wide range of cool, daylight-balanced lighting possibilities. The illuminated stage plate offers transmitted illumination for translucent specimens, while the two gooseneck lamps and ring-light provide both axial and off-axis lighting. The control module allows for independent control over all four light sources, making the system highly flexible. 20X and 40X Magnification Settings. 45° Inclined Binocular Head with 30mm Super Widefield WH10X/20 Eyepieces. High Resolution with Great Flatness and Contrast. Sharp Stereo Erect Images over a Wide Field View. Accurate Alignment Ensuring Fatigue-Free Viewing. 76mm in Diameter Focusing Rack. Sturdy base with 12 pillar and focusing rack. 6500K daylight-balanced LED light sources. Two 3W gooseneck lamps for directional lighting. A 4W ring light for even iilumination. A 2W illuminated stage plate for transmitted light. Manufactured under ISO 9001 Quality Control Standard. Head: 45° inclined 360° swiveling binocular. Eyepiece: WH10X/20 super widefield 30mm high-eyepoint. Interpupillary Distance: 1-7/8" - 2-15/16"(47-75mm). Head Mounting Size: 3 (76mm) in diameter. Accessory Mounting Size: 1-7/8 (48mm female thread) in diameter. Pillar: 12" (305 mm) high, 1-1/4" (32mm) diameter. 12.5"x10"x0.75 (320x280x20mm) Solid Cast Steel Base Plate. Power input: DC 5V, 4A. Gooseneck lamp output (each): 3W. One 20X / 40X Binocular Stereo Zoom Head. One Pair of Super Widefield WH10X/20 Eyepieces. One Pair of Foldable Rubber Eye-Guards. One base plate for stand. We offer 30 days from the date of receipt (verified by tracking information) to request a return on a unit. We appreciate your patience and understand everyone has a critical need for their unit, and do everything we can to ensure that these requests are handled as quickly as possible. Items damaged in transit are not covered by us. Include your order number, reason for return, and if any pictures are required for your claim, please include them also. Follow the issued instructions, and once received, we will process the item in, and check to ensure everything is there. Processing is done first come, first serve, and can take between 1-4 weeks to process (depending on how many requests we currently have in queue). We thank you for your patience while we work on your request. The item "20x-40x Super Widefield Stereo Binocular Microscope with LED Gooseneck and Ring" is in sale since Tuesday, January 19, 2016.